A few months back, we were asked to present the comic and related resources at the Ontario Heritage Fairs Association AGM. The Association “offers students the opportunity to explore the many aspects of their Canadian heritage in a dynamic learning environment and to present the results of their efforts in either French or English in a public exhibition” (stolen directly from the website). These kinds of presentations are invaluable to both Jason and I as there’s always an angle or lens or suggestion we hadn’t yet considered in terms of how best to develop and share the comic with scholastic audiences. 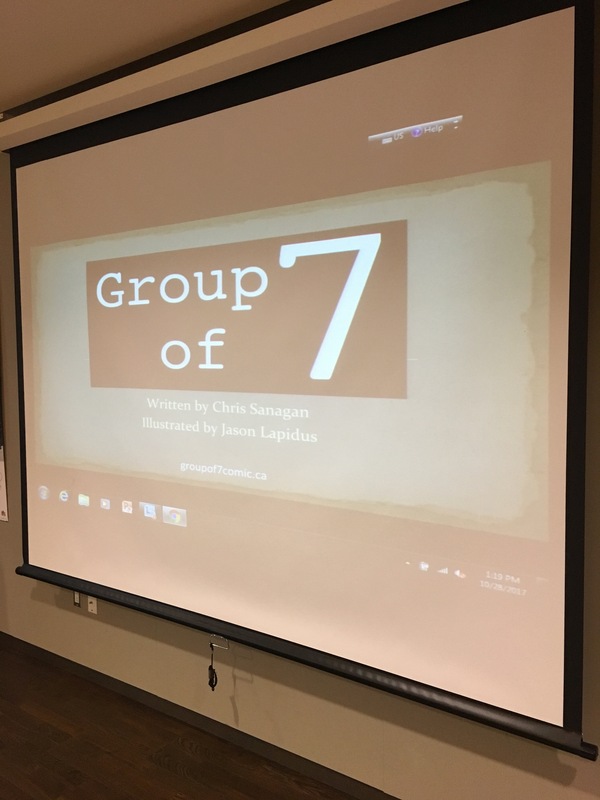 Overall, the meeting was vigorous and engaging and yet again affirmed the value of using resources like Group of 7 in a classroom setting. If we can help start a conversation about Canadian history, we’re pleased to do so. This entry was posted in Archives of Ontario, Education, Ontario Heritage Fairs, Toronto, Workshop. Bookmark the permalink.